Madame Saïdi paints the portrait of an unusual, old Iranian woman. She’s the mother of a martyr and a well-known personality in Ali Abad, her popular neighbourhood located in the south of Tehran. 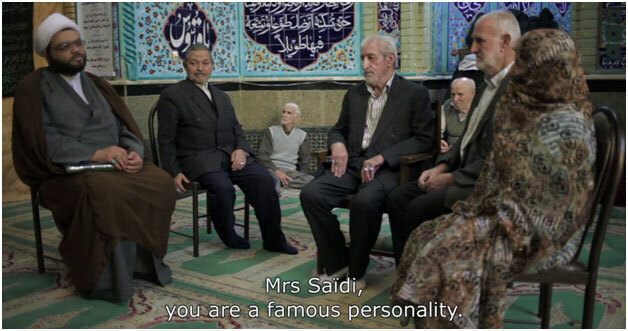 To everyone’s surprise, Madame Saïdi has become a movie star in her old age. She’s an eccentric and paradoxical character in a very complicated society. She does extaclty the opposite of what we would expect. Madame Saïdi is always ready to laugh, and above all, to play. Bijan Aquentil is a French film director. He was born in Paris from a French father and an Iranian mother in 1978. After studying Philosophy and Visual Anthropology, he directed a documentary film series in Iran. In 2007, he co-directed Les murs ont des visages with Paul Costes, a documentary that has been screened at the États Généraux du Film in Lussas and Doc Point in Helsinki. In 2012, he participated in a residence in Périphérie, in Montreuil, and directed La Nuit remue which won the Grand Prix of the French competition at the FID Marseille. Born in France in 1977, Paul Costes has spent his childhood in Morocco. He studied Farsi in Paris and acquired his first training as a filmmaker by working on fiction crews. Since 2002, he has been directing documentary and fiction films, using the codes of both genres to experiment with the tools of storytelling. His work has been shown in numerous film festivals, including Clermont-Ferrand, Cinéma du réel, Lussas, Pantin, Doclisboa, FID Marseille, Doclisboa, Doc point.Gust of wind. Fiction. 23’. 2002 – Raw materials. Documentary. 30’. 2006 – The faces on the wall. Documentary. 56’. 2007 – Ashes. 23’. Fiction. 2009. Prix à la qualité du CNC – The blue room. Documentary. 49’. 2015 – Mme Saïdi. Documentary. 59’. 2016.